These make me squeel they are so sweet and pretty! I got the headbands in the little girl department at Target, a packet of 4 for $2.99, so they are a little bit big on Penelope, but they fit me too. I rocked the pink one the other day when I was wearing a pink maxi dress. 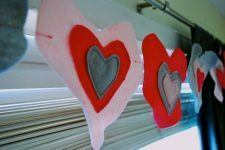 Remember the felt I told ya’ll I bought myself for Mother’s Day over on our Facebook page (if you haven’t joined us, come on over, its always fun!) It is felt from one of my favorite designers, Heather Bailey. I went Heather Bailey crazy for Penelope’s 1st Birthday party, you can see for yourself here. It took me forever to get the guts to open up the package they came in because it was so pretty to look at them like this! 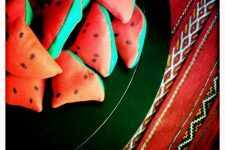 Arn’t the colors yummy? 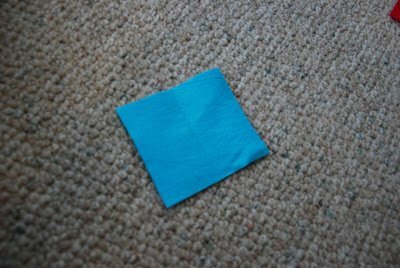 Oh, and this felt is BAMBOO! It is so soft and luxurious and eco-friendly to boot. Penelope and I did this project together. Well, as together as you can, with a wild, 18 month old. 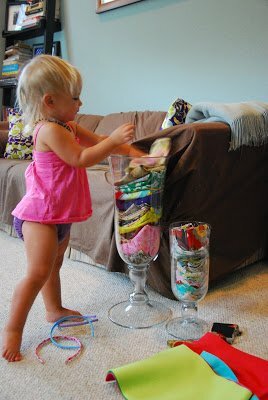 I took down my glass jars of scrap fabric from my craft space and let her “pick” her fabric. This resulted in her taking out every single piece, throwing them on the ground and then attempting to climb IN the container. With a little leading from Mama, these were the colors we settled on. The blue fabric is from the remnants I picked up at the design store in Havana, that I talked about here. The purple is left over from the very first dress I made her, you can see that here (just don’t laugh). 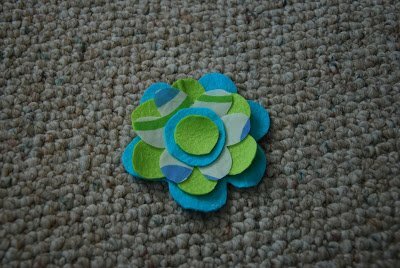 I got the idea of how to make the flower shape from when I made Penelope’s tissue paper birthday sign. 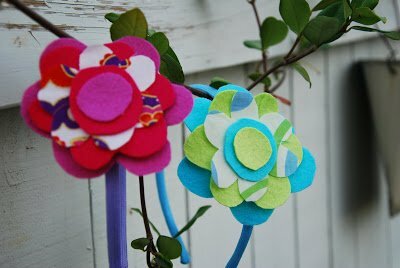 The sign is a ton of little tissue paper flowers cut out just like this and smooshed together. So, you cut out one square, like so. Then you fold it in half. 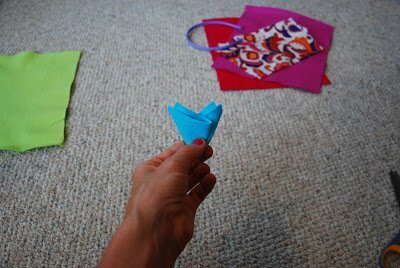 Then fold over each side to make a little cone/triangle shape. 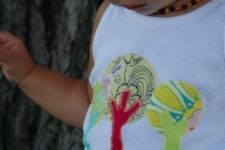 Then you cut off the top and make a rounded/scalloped shape, like so. 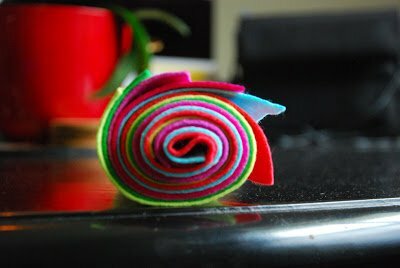 When you unfold it, your flower will look like this. 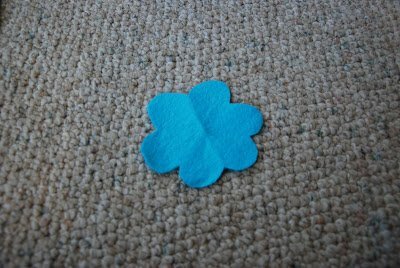 You may have to clean up the shape of your flower, depending on how well you folded and how well you cut. 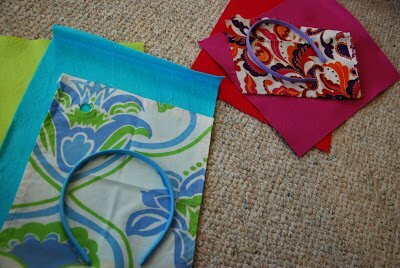 If you do, it’s easy, because you have the basic shape and can just go around the edges with your scissors and make it more crisp and even. Then layer it up! 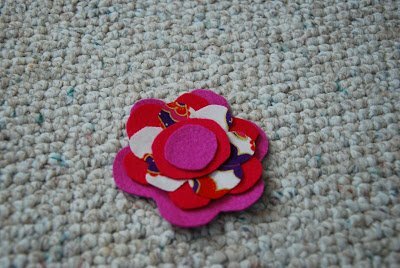 I did two flowers in felt and one flower in fabric. Then I added two circles for the center. I did the circle free hand as I was cutting, and I like that it was imperfect and obvious it was handmade, but you could certainly get a button and trace a perfect circle and then cut if you want. Here is the pink one. 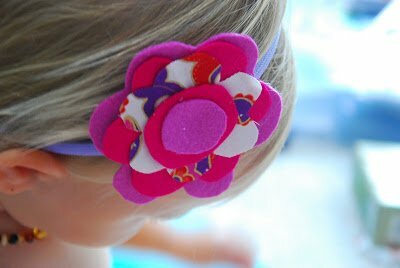 After you find your right layer choice, just hot glue together and then hot glue the flower to the headband. 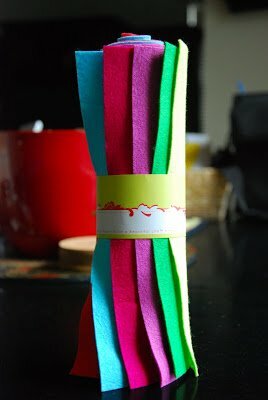 I hardly used any of my precious bamboo felt for this project but the results are BIG! 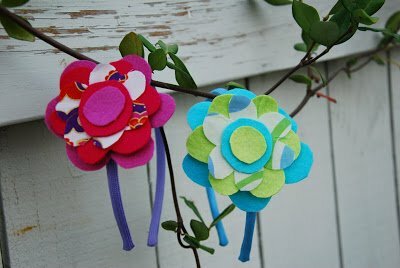 I see lots of fabric felt flowers making in my future. For some reason, Penelope will wear a headband for a longer period than a regular hair bow. What do you think? Cute for baby girl to wear but is Mamas wearing hair bows a fashion crime? Bamboo felt?! I think I'm in love! Those are adorable!! Great job, Steph!! Love them, for both baby girl AND mama! @eidolons…yes, it is amazing! It was such a splurge to spend $20 on a pack, but it will last me a long time and it is so worth it! @Maureen…thank you! I am very proud of these babies! @Monica…You have such good style, so that makes me feel better! So adorable, but why can't I get my flower to turn out? I think I am either folding the cone shape wrong or cutting the top off wrong. 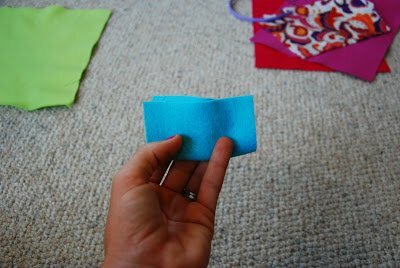 Do you waste a lot of felt on the cut? 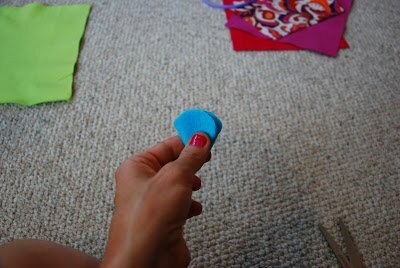 @anonymous…I don't waste a lot of felt, but I do spend time shaping up the petals after I have done the basic arch on the cone to get a better flower shape. Does that makes sense?